Livingston Parish (French: Paroisse de Livingston) is a parish located in the U.S. state of Louisiana. As of the 2010 census, the population was 128,026. Its parish seat is Livingston. Livingston Parish is part of the Baton Rouge, LA Metropolitan Statistical Area. 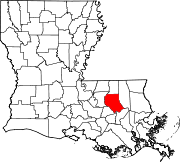 Livingston Parish was created by the state legislature in 1832 from part of St. Helena Parish. The historical parish seats were Van Buren (1832–35), Springfield (1835–72), Port Vincent (1872–81), and Centerville (1881–1941). Livingston became the seat of government in 1941. The name Livingston is an eponym honoring Edward Livingston, a prominent American and Louisianan, a jurist and statesman who assisted in the drafting of the Louisiana Civil Code of 1825. Livingston Parish is one of the Florida Parishes. During the 2016 Louisiana floods, Livingston Parish was one of the hardest hit areas; an official estimated that 75 percent of the homes in the parish were a "total loss." According to the U.S. Census Bureau, the parish has a total area of 703 square miles (1,820 km2), of which 648 square miles (1,680 km2) is land and 55 square miles (140 km2) (7.8%) is water. Scott M. Perrilloux is the district attorney for the 21st judicial district of Louisiana, comprising the parishes (counties) of Livingston, St. Helena, and Tangipahoa. Together with the parishes of St. Helena and Tangipahoa, Livingston Parish forms Louisiana's 21st judicial district. As of the census of 2000, there were 91,814 people, 32,630 households, and 25,549 families residing in the parish. The population density was 142 people per square mile (55/km²). There were 36,212 housing units at an average density of 56 per square mile (22/km²). The racial makeup of the parish was 94.35% White, 4.22% Black or African American, 0.36% Native American, 0.18% Asian, 0.02% Pacific Islander, 0.19% from other races, and 0.68% from two or more races. 1.11% of the population were Hispanic or Latino of any race. There were 32,630 households out of which 41.60% had children under the age of 18 living with them, 63.10% were married couples living together, 10.70% had a female householder with no husband present, and 21.70% were non-families. 18.20% of all households were made up of individuals and 6.50% had someone living alone who was 65 years of age or older. The average household size was 2.80 and the average family size was 3.17. In the parish the population was spread out with 29.50% under the age of 18, 9.10% from 18 to 24, 31.50% from 25 to 44, 21.40% from 45 to 64, and 8.50% who were 65 years of age or older. The median age was 33 years. For every 100 females, there were 98.50 males. For every 100 females age 18 and over, there were 94.50 males. The median income for a household in the parish was $38,887, and the median income for a family was $44,071. Males had a median income of $36,508 versus $22,325 for females. The per capita income for the parish was $16,282. As of August 2001, about 43,800 people were employed in the parish. The unemployment rate was 4.8%. About 9.10% of families and 11.40% of the population were below the poverty line, including 11.70% of those under age 18 and 15.80% of those age 65 or over. Hurricane Katrina had a dramatic effect on the population in Livingston Parish. Many displaced families of the affected Parishes have moved into the area and as a result, the population of the parish has increased significantly. On June 6, 2007, the Census Bureau published a report "Special Population Estimates for Impacted Counties in the Gulf Coast Area" which shows a population increase for Livingston Parish to 111,863 as of January 1, 2006. Livingston Parish is home of one of two installations for a gravitational wave observatory (LIGO) which is a facility dedicated to the detection of cosmic gravitational waves and the harnessing of these waves for scientific research. As of January 2015, Livingston Parish is Louisiana's fastest-growing parish. Livingston Parish is a Council-President parish governed by a Home Rule Charter and enforced by a Parish Council and Parish President. The Parish President is the head of the executive branch of government, and the Parish Council comprises the legislative branch. Livingston Parish is divided into nine council districts. The borders of each district are drawn so as to even out the population in each district. At the end of 2014, the construction of a new Livingston Parish Courthouse was completed, with the ribbon-cutting scheduled for mid-February 2015. The new facility contains over 100,000 square feet; it replaces an antiquated complex dating back more than seventy years. In its early history, Livingston Parish was “Solid South” Democratic, although it demonstrated Piney Woods voting behavior in 1928 when it was Herbert Hoover’s best parish in Louisiana. Like other parishes in the Baton Rouge metropolitan area, Livingston remained loyal to Harry S. Truman in 1948 and to Adlai Stevenson II in 1956 when Louisiana’s electoral votes went to Strom Thurmond and Dwight D. Eisenhower respectively. Barry Goldwater became the first Republican to win the parish in 1964, and in recent years, Livingston Parish has been one of the most Republican parishes in Louisiana, and one of the most Republican county-equivalents in the nation. It has gone Republican in every presidential election since 1984. In the 2004 election, George W. Bush received 33,976 votes, or 77% of the parish’s total, more than three times the 9,895 votes (22%) his opponent, John Kerry, received. The Republicans fared better still in the 2008 election, in which John McCain received 43,269 votes (85% of the total) to just 6,681 votes (13%) for Democrat Barack Obama. The Livingston Parish Public Schools operates all public schools in the parish. ^ "State & County QuickFacts". United States Census Bureau. Archived from the original on July 14, 2011. Retrieved August 10, 2013. ^ StoppingPoints.com. "Livingston Parish Historical Marker". ^ Michael Kunzelman (August 16, 2016). "Louisiana governor: 40K homes damaged by historic flooding". Yahoo! News. AP. Retrieved August 16, 2016. ^ "Population and Housing Unit Estimates". Retrieved January 19, 2019. ^ "U.S. Decennial Census". Census.gov. Retrieved August 10, 2013. ^ "Annual Estimates of the Resident Population: April 1, 2010 to July 1, 2012". Census.gov. Archived from the original on July 7, 2013. Retrieved August 10, 2013. ^ United States Census Bureau. "Special Population Estimates for Impacted Counties in the Gulf Coast Area". Archived from the original on 2007-02-25. Retrieved 2007-04-29. ^ Livingston Business Journal, Jan. 2015, p. 26. ^ a b Leip, David. "Dave Leip's Atlas of U.S. Presidential Elections". uselectionatlas.org. Retrieved 2018-03-09. Wikimedia Commons has media related to Livingston Parish, Louisiana. McCulloh, R. P., P. V. Heinrich, and J. Snead, 2003, Ponchatoula 30 x 60 minute geologic quadrangle. Louisiana Geological Survey, Baton Rouge, Louisiana.